The Israel Physical Society is a voluntary non-profit society which acts to stimulate research and education in physics. The organization is open to all physicists (not only from Israel), including students, and those who support research and education in physics. Any physicist, student of physics, or simply a person who supports research and education in physics can become a member, if he/she accepts the aforementioned objectives of the IPS. Joining the IPS has never been easier. Quick links: Register; Login; Submit. Visit our facebook page. The fifth edition of the Joint EPS-SIF International School on Energy – "Energy: Where we stand and where we go" will take place from 22nd to 27th July 2019 in the beautiful venue of Villa Monastero, Varenna, on Lake Como under the guidance of the two Directors Luisa Cifarelli (University of Bologna and Centro Fermi) and Friederich Wagner (Max-Planck-Institut für Plasmaphysik). The School, characterized by a strong interdisciplinary approach, aims to present the state of the art and future perspectives of the international research on crucial issues such as the global energy problem and the technologies for different energy sources. Solar, thermoelectric, aeolian, biomass, nuclear energy and climate are some of the subjects that will be treated. Professor emeritus Shmuel Fishman died on Tuesday, 2 April, in Haifa, Israel. His funeral will take place on Monday 8 April, 15:00, at the Tel Regev cemetery. Shmuel Fishman was one of the founders of "Quantum Chaos". He is well known for providing the theoretical foundation for "dynamical localization", a dramatic way in which quantum-to-classical correspondence is broken. Over his long career Shmuel made numerous contributions to our understanding of phase transitions, driven dynamical systems, and non-linear effects in atom optics. Shmuel was a caring and wonderful mentor, and many of his former students serve as faculty in universities in Israel and around the world. The Israel physical society lost a valuable, kind and respected member. Congratulations to Prof. Guy Deutcher, Prof. David Horn, Prof. Hagai Netzer (Tel-Aviv University)and Prof. Joshua Zak (Technion) who were honored at 2018 IPS meeting as Fellows of the Israel Physical Society. For his leadership in experimental and theoretical research in the theory of superconductivity and in particular the "proximity effect". 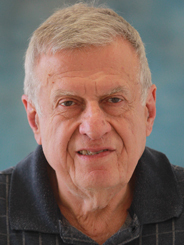 For his influential contributions to the research on percolation and localization in two dimensions and, for his leadership in building experimental condensed matter physics in Israel. For his ground breaking discovery of the Dolan-Horn- Schmidt Duality in hadronic physics, and pivotal role in creating a community of high energy theoretical physicists in Israel. For initiating observational astronomy in Israel, and for ground breaking research especially, the measurements of the masses of black holes in quasars centers and active galaxies and for opening the gates to astronomy to the general public. For his contribution to condensed matter physics and in particular for the discovery of the magnetic translation group and the KQ representation also known as Zak representation and for the discovery of the topological phase in the band theory of solids known as Zak phase.